There are so many shades of teh Malabrigo to love, but I think that I might be currently knitting with my all-time number-one-with-a-bullet: Bobby Blue. It's just...the perfect blue. And I am not really even a blue person, but this color just sends me into paroxysms of delight. Yesterday I cast on for the 'Eye of Partridge' shawl with some Malabrigo Lace and I am just feelin' it, in fact I can't put it down, despite the massive amount of textbook editing I should be doing. Work--it just gets in the way. I cannot do a long tail cast on to save my life. It has been shown and explained to me by at least 4 different knitters with various presentational styles at different points in my knitting career. Explanations have ranged from the kinesthetic "move the yarn like a triangle and then... ", the visual "do you see how you are creating a triangle? Next...", and finally, the text-heavy "In order to do th long tail cast-on you must create a triangle, you'll then proceed to..." None of these were even remotely successful--I just don't get it. Does not compute. I've even spent extensive time trolling around Youtube for helpful videos and have yet to find the video that will make it all make sense. I've actually really tried as opposed to fake tried (like I used to do with math in middle school) and just can't grasp it at all. Weirdly I am sort of good at things that can be hard for other knitters, like the kitchener stitch, stranding and even seaming. But the long-tail cast is just not happening for me. 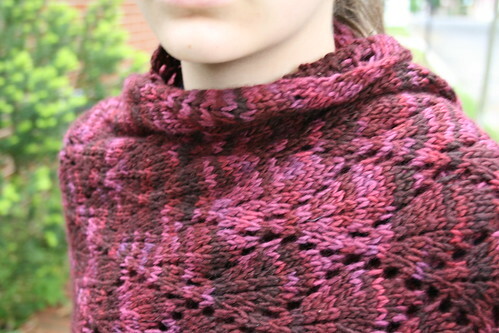 You all are too kind to me--I appreciate the nice comments about the shawl as well as the tips for using the camera. My niece (a photographer at an ad agency) had perhaps the most impertinent suggestion of all : "...well, why don't you read the manual and then just play around with it?". Huh? Come again? This younger generation, they think they have it all figured out. Sheesh! I have just returned from a 5 day trip to Minneapolis . My trip back home just happened to coincide with a monumental sale of staggering proportions at my fave Twin Cities brick and mortar yarn shop (Miss Thing Linda at Yarnzilla doesn't count as she is mainly doing Internet business), Borealis Yarns. Being a Minneapolis chick all the way, it was a bit of a strain to drive those extra 8 minutes to St. Paul, but it was well worth it as everything in the joint was 20% off. You can see the damage above.(N.B. The Hazel Knits was not purchased in Mpls. but sent to me there. Just trying to manage my deliveries if you know what I mean). While in St. Paul, I also checked in with my second favorite yarn store, The Yarnery, where I got my grubby little hands on more Hand Maiden Casbah sock yarn. It's official, I am now stalking/hording this stuff. It is luscious and gorgeous and shiny, and possesses that most beguiling of all yarn fetish attributes: it's somewhat hard to get your hands on. Yes, scarcity really does it to me every time and the acquisition machine just kicks into overdrive. "Oh, this is hard to get? I'll take seven, please". Sad, but true. My parents and I paid a visit to my oldest friend on the books, Phil. 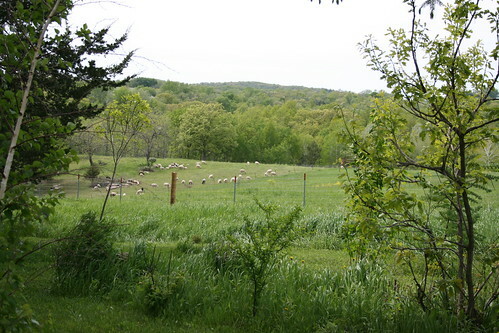 He and his partner Randy have a farm in Star Valley, Wisconsin. Last fall they acquired a flock of sheep and several guard llamas to boot, so visiting was a must. When we were there he accused me of "...only visiting him to get blog material". Puh-leeze, what is wrong with him? Come on now. We had a fantastic albeit short visit. 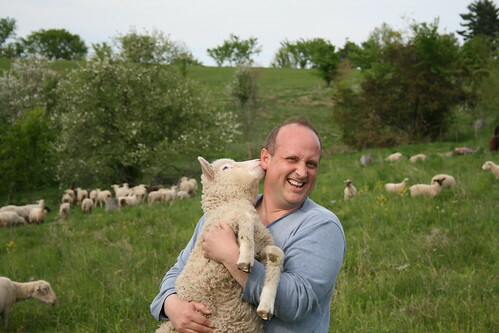 Above you see a picture of him holding Helen, a bottle-fed blind lamb that spent the entire time he held her suckling on his ear. Helen, many tragic individuals have been there before you, so take a number, sister! 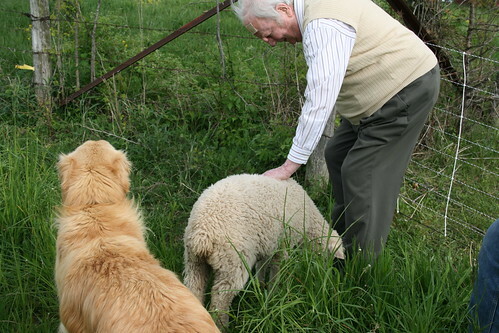 We had a great visit, and my Dad, who has somewhat advanced Alzheimer's, especially enjoyed all the animals on the farm. When you have that disease, uncomplicated interactions are so welcome, and animals can provide that in meaningful ways. I am very pleased to announce the completion of a semi-impressive WIP. Yes, I have actually finished something that a. is for someone that weighs over 5 pounds, b. is not a knitted tube and c. wasn't started 8 months ago and therefore only had a little bit to go before it was considered completed. Please don't think that I am recanting my position on the cowl (hell no, I fiercely love that knitted tube), it's just that occasionally it's nice to finish a project that feels like it has some import to it. I know you all know exactly what I'm talking about. I am calling this the Falling Grape Leaves Shawl, and it might be the first dark purple thing that I have ever owned--for real! I am still not thoroughly convinced about the color, but have just decided to go with it. Last month I wore blue for the first time in about 6 years and I received extremely positive feedback for it from shocked friends and colleagues, so branching out color-wise seems to be a good idea once in a while. Dates: March 16-May 20. Can you believe I thought I was going to be finished with this in time for my trip to Montpellier? Puh-leeze.. There is another first to report--my new camera is making its' debut with this post. There was quite a build up to being able to get this camera. My entire repertoire of charming adolescent behaviors were dusted off. These included begging, pleading, pouting, slamming doors, promising the moon, unfortunate petulant remarks, and the hardest of all, patience. But in the end my generous mate came through and gave it to me for our anniversary, which is today. As my mother would say "he's a good lad" and I am a lucky, lucky girl. I am still learning the ropes and making my way through the manual. Please share any smart tips you might have for using the Canon Digital Rebel xti, and feel free to point me in the direction of more information about photography with this type of camera if you can. So. Excited! Cowlify: You know you want to! 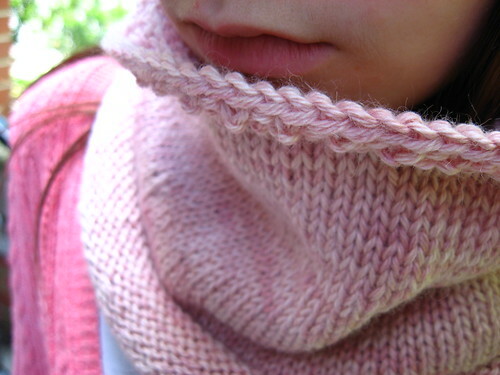 To say that the cowl, a humble garment with inauspicious origins and an unfortunate link to the 'cowl neck sweater' of the mid-70s that I think most of us husky gals would have done well to avoid, is sweeping the nation by storm would be an understatement. 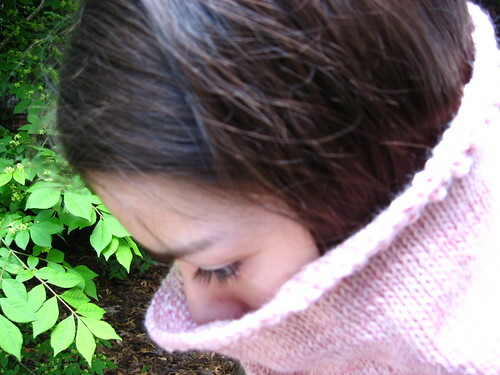 I mean we have many prototypes to choose from on Ravelry, and if you are reading blogs you know that this one and this one and this one are nothing short of hand knit perfection. And if this stunning picture right here doesn't send you into cowliscious paroxysms, well you just don't get it, my friend. (Leslie you are right, all this linking wears a girl OUT). I have come to believe several things about the cowl. If affords the knitter the satisfaction of working on a truly short project (not a fake short project like socks or a scarf, for example) and yet ending up with a nice big piece of fabric. Like a giant gauge swatch, you can really see what the yarn does under certain conditions, something very exciting when you're talking about sock yarn. It also is the ultimate stash buster project. 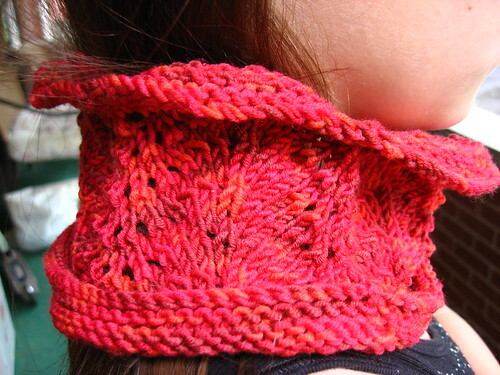 Why would you need to purchase yarn specifically for a cowl? You know you have one or two skeins of something or other in your stash that will fit the bill. Give in to the cowl, it will do you right every time. 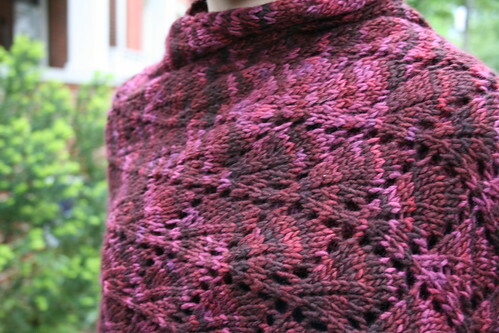 This yarn knits up into a fabric that is soooo soooft and has a lovely sheen. I bought this skein at MDS&W several weeks ago. Since I didn't know I was going to make it into a cowl at the time, I have technically not violated my own 'don't buy yarn for a cowl' rule, because it didn't exist yet. See how that works? This post marks a special occasion on this blog. This is the last time I will be using my current camera, as I have graciously been given the green light by my frugal mate to get a brand-new digital slr camera. Yes, the tarrying is over. Those that know the person with whom I negotiate such purchases will likely not believe me, but it's true. Watch this space for super special pictures, starting Tuesday! Summer vay-cay has arrived for this here academic. Last summer that meant severe binge knitting and indolent cocktail-induced lolly-gagging around, but this summer I actually have a lot to accomplish, so there will be lots more worky-worky and much less knitty-drinky. 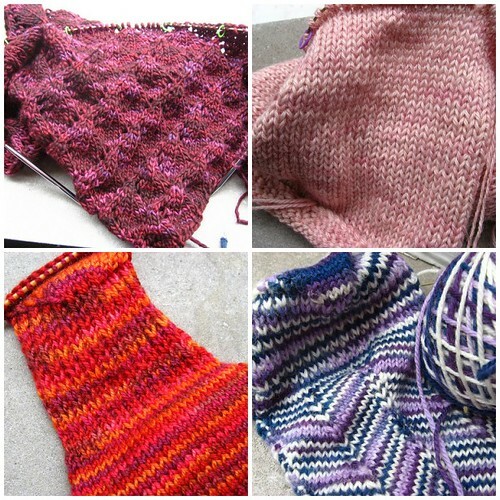 As you can see above, I am awash in WIPs (from top left, Falling Leaves Shawl in Malabrigo 'Velvet Grapes', Gloria Cowl in A Verb for Keeping Warm Alpaca/Silk 'Lux', Basic Sock in Hazel Knits 'Sailor's Delight', Jaywalkers in LL 'Grumperina'). Incidentally those are only the seasonal WIPs, I have left out all scarf and hat WIPs for the sake of clarity. The situation is severely out of control. And what is the only thing I want to do right now? That would be winding my newly acquired skein of Handmaiden Casbah Sock (Paris Two) and doing unspeakable things to it with a size 1.5 HiyaHiya circular needle. What is wrong with me? I'm trying to get away from the feast-or-famine approach to work and leisure and fine a way to keep it all running at a constant speed as last year's back-to-school world of pain scenario is one that I'm trying to avoid. Any tips you all might have for striking a good balance between work and knitting? How does a normal person integrate job/family/home responsibilities with the desire to self-immolate with yarn? Can'tcha help a person with terrible work habits out? Reading all of the post-Maryland Sheep and Wool blog entries in knitblogland has brought to the fore in a very glaring way (at least to me) the shallowness of this here attendee. While others used verbs such as "meet", "encounter", "experience" as they detailed the fabulous time they had hooking up with friends new and old, admiring the animals, and appreciating the mountain music practitioners, my verbs were all related to consumption and acquisition: "buy", "obtain", "purchase", "score" and "eat". I am a bad person. But I am still riding high on my new yarn, and have it in a special bag that I take out at night for talismanic fondling and whiffing. 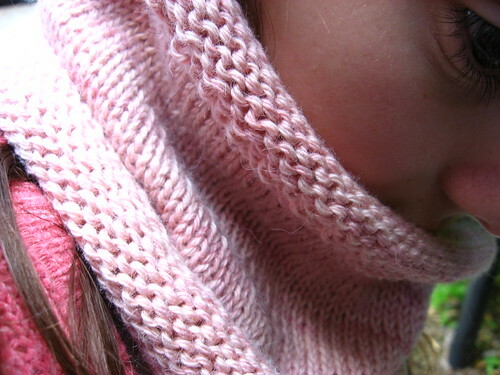 I did put my new yarn away long enough to make another cowl. Now you know I am all about LB, and any pattern that she comes out with, I am just automatically on board. (Kind of like those bands you loved when people still bought albums, and you waited patiently for their album to come out on that magical Tuesday and you scooped it up immediately). So when Miss Thing posted Grassy on Stitch Marker, I was all over it, enough so that I bought my pal Kim a copy, in a passive-aggressive attempt to shame her into doing it, too. 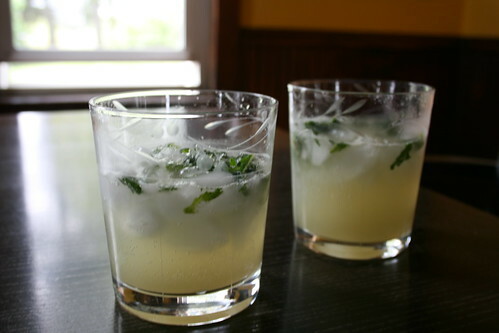 -within minutes of arriving, you will likely be consuming a funnel cake and a lime fizz. And then repeating this gesture right before leaving, thereby insuring that you might likely feel like vomiting and sleeping at the same time. -she is strongly attracted to any and all demonstrations, and used the power of her charms/ability to invade the personal space of others to get the demonstrators to let her try whatever they're doing. In this case I am talking about basket weaving and spinning. She now is begging for a drop spindle. Help. Uncle WonderMike, can you be of some assistance here? -she will be inexorably drawn to any and all creative anachronism people (this is so the opposite of me) and bluntly ask them "Who are you supposed to be? ", which after speaking with several of these comely wenches becomes "What are you supposed to be?". -if the possibility of free buttons at a Ravlery meet-up has been suggested, and these said free buttons run out, well, that is going to set her off. Because this girl is all about buttons. "My mom is on Ravelry, are you sure you don't have any more? No, not the small ones, the bigger ones that you write on with the sharpie...". Despite the peculiar behaviors above, we had a great time. There were the vendors that I was looking forward to seeing, like Shelridge Farm , Tess and Brooks Farm, who all had their usual fabulous yarn and patterns. Miraculously the Fold booth was not crowded and the shoppers were civil. There were other unexpected surprises: The Llamajama alpaca yarn was new to me, as was the Cloverhill shop from Baltimore which had an incredible selection of indie-type sock yarn. What better way to shake off the Chevron wip doldrums that to cast on for another project, one that promises not the instant gratification of the cowl (Grassy: you will be mine, but all in due time) nor the mindless round-and-round of the stockinette sweater (Wicked, I've got your number and you're on deck), but rather the extreme intricacy and high cognitive demand of lace? Hey, I'm nothing if not utterly impractical, but terrible predictable (check the name of the blog, people). 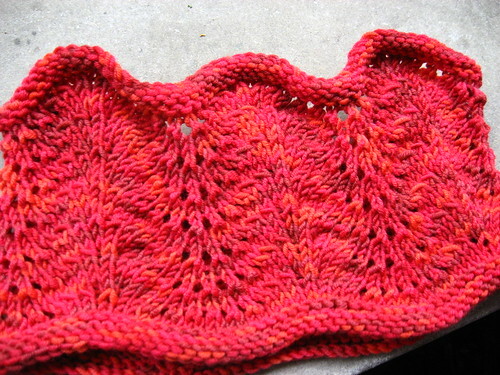 I want to make a shawl for a very important person, and am asking for some recommendations. 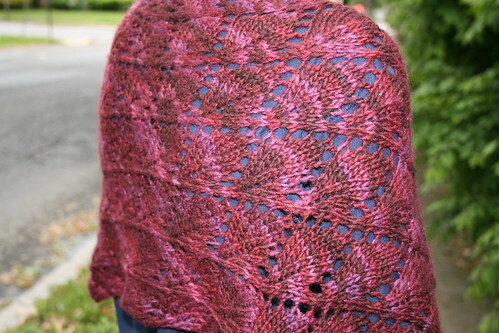 I have made one lace project, the Shetland Triangle, a project that real lace knitters might potentially dismiss as not really a lace project at all. But it was a gas, and I was happy with it. Above you seen three skeins of Malabrigo lace weight (470 yards each) that are each just itching to become a shawl, and so I am asking you all for your shawl suggestions. Please weigh in on this important matter. MDS&W alert: Peeper-lou and I will once again be hitting Maryland Sheep and Wool this year, this time with Purlfriend in tow. So. Excited. Remember last year's hi jinx, when the little miss was featured on Let'sknit2gether with her "I only knit with corn" schtick? We're hoping for more fun this year, which will certainly include Brooks Farm and Tess yarn, funnel cakes and NOT going to the Fold booth and getting elbowed by craven shoppers. We'll be there on Sunday, and hope to see some of you there!